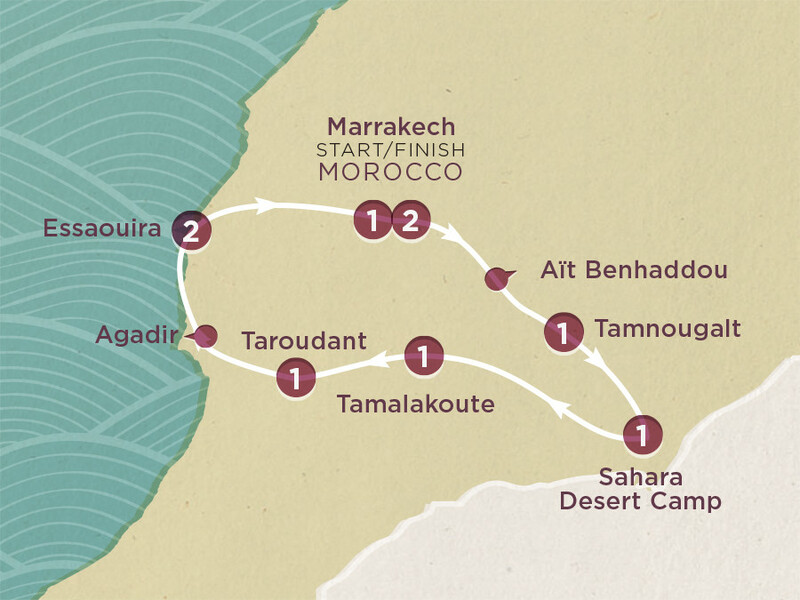 Feel the pulse of the Sahara Desert on on this once-in-a-lifetime adventure, starting and ending in Marrakech. Check out the best landscapes in the northern Sahara, get lost in winding souks, then ride a camel over the dunes at sunset – just like the nomadic Berber people. This desert exploration features fun overnight stays in a desert camp and a kasbah, so be sure to rock it! Get your first taste of Morocco’s delicate fusion of old and new world in the 18-plus souks that fill the city streets. Just make sure you arrive in time for tonight’s welcome meeting. Kick-start your day with a guided city tour and check out the Saadian tombs, the Bahia Palace and Jemaa el-Fnaa - a town square that houses snake charmers, singers, dancers, drummers and more. Today: brace your eyeballs for some truly epic scenery as we cross the Tizi n’Tichka pass. Here, fields of grazing sheep clash with unforgiving rocky terrain, mud-brick houses and nerve-shredding hairpin bends. Bonus: a visit to World Heritage-listed Ksar in Aït Benhaddou. Tonight, sleep it off in a kasbah. Blast across sand flats, wind between desert dunes and rattle your bones over the dry Draa River on the way to our camp on the edge of the Erg Chigaga dunes. This is glamping, desert style. Did we mention you can opt in to ride a camel? Bye, desert! Today we’re hitting the road to the small village of Tamalakoute, where a local Berber family will welcome us into their home. As far as road trips go, crossing the otherworldly volcanic landscape of the Jebel Siroua Mountains by 4x4 bats well above average. Expect endless twists through rock-strewn desert vistas, climbing to an elevation of 2,500 m with a window-slideshow of deep valleys and barley and saffron fields. In the Argan Forest there are goats that live in trees. Seriously, though – how awesome is that? Spend some time staring at them before we make tracks to the beach. Hold onto your hat! This charming fishing town is a mecca for windsurfers thanks to its howling coastal wind. Opt in to try it yourself, or have a go at one of our other optionals. What’s it gonna be? Kayaking or horse riding? Pro tip: dine at one of the open-air fish stands tonight. Wash the last of that desert sand off before we head back to the Red City for a chance to meander the medina in Marrakech. ‘Our last night in Morocco’ sounds like a cheesy romance novel, but it’s happening! Write your own ending by spending a few more days (or weeks) in this sensory overload of a land. We’re outta here after breakfast.